In what could be a bad dream or a bad movie, an alien life form descends on the Sampit River, making itself at home and threatening to consume its new neighbors with piranha-like jaws. This invader isn't from a distant galaxy - it's a South American fish called a red-bellied pacu, and its meals consist of plants, insects and other fish. At 33-inches long, it probably outgrew its owner's fish tank, and the budding aquarist simply dumped it in a local stream. The pacu adapted its diet and spent its lonely days trolling the river without a mate, sparing the local ecosystem the nightmare of unchecked reproduction that can accompany aquatic invasive species, until it was caught recently by a Georgetown County fisherman. Aquatic invasive species are defined as non-indigenous organisms that live most or all of their lives in water and have the potential to adversely affect ecological health or economic activity, according to the S.C. Aquatic Invasive Species (AIS) Task Force. The 35-member AIS Task Force was created in 2006 to develop a statewide AIS management plan and enhance interagency communication and coordination regarding aquatic invasive species issues. While the pacu in the Sampit got local headlines, more pervasive in South Carolina is the problem of aquatic invasive plants, especially hydrilla. The terminology has evolved over the years, but organisms bearing the label "noxious" or "nuisance" are likely to fall under the AIS umbrella. 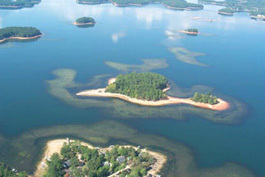 It is also important to note that the AIS term applies to a particular ecosystem; for instance, an invasive species in South Carolina may be a stalwart native in the Chesapeake Bay. Sometimes termed "biological pollution," AIS intruders can strike freshwater and marine environments alike, leaving South Carolina's 11,000 miles of rivers and streams, 200 miles of shoreline and 750,000 acres of estuaries vulnerable. Some exotic species can coexist with local flora and fauna (and may even offer untapped benefits), but most AIS creatures tend to resist natural population controls, according to the S.C. Department of Natural Resources and the S.C. Aquatic Plant Management Council. As a result, invasive plants and animals often reproduce rapidly, edging out native species for limited resources. "Aquatic invasive species typically develop very large populations that compete with or displace desirable native species," says Steve de Kozlowski, assistant deputy director for the DNR's Land, Water and Conservation Division and chairman of the S.C. 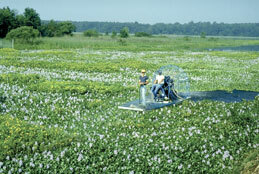 Aquatic Plant Management Council. The results of rapid reproduction can be devastating. Non-native invasive species cost the United States an estimated $120 billion per year, and nearly half of the nation's endangered or threatened species owe their classification at least partially to the presence of a non-native species. In South Carolina, the economic and ecological repercussions include blocked water flow for municipal, industrial, agricultural and power-generation purposes; degraded water quality; boat damage; flooding because of restricted water flow; fish population declines; reduced waterfront property values; expanded mosquito breeding grounds; and impaired recreational outlets for swimming, hunting, fishing and boating. South Carolina spends about $450,000 per year managing invasive aquatic vegetation threats alone, and Florida spends more than $20 million, according to de Kozlowski. 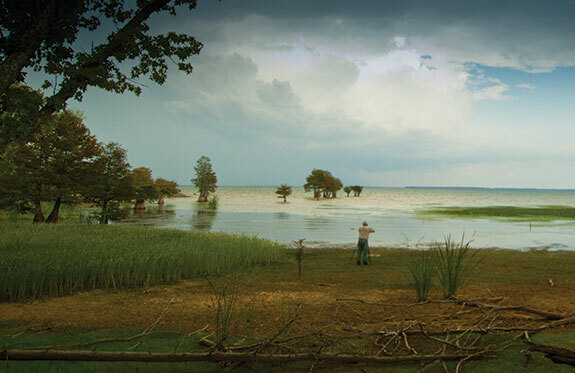 In 1991, an invasion of the aquatic weed hydrilla shut down the St. Stephen hydroelectric plant on Lake Moultrie for weeks, costing $4 million in lost productivity and $526,000 worth of gamefish deaths. Another example of an aquatic invader making its presence known by causing equipment malfunctions is the Asian green mussel's 2006 entry into Charleston Harbor. DNR biologists recently discovered hundreds of dead shells of the green mussel (Perna viridis) when they worked to unclog water supply lines to tanks in one of the outdoor saltwater systems at the agency's Marine Resources Division in Charleston. The tanks receive water pumped from Charleston Harbor and are regularly inspected. Wallace Jenkins, a senior fisheries biologist with the DNR, suspects that water circulation to some of the tanks was brought to a halt when a pump that had been out of use for nearly two months was brought back online. "A likely scenario," says Jenkins, "is that larval mussels settled heavily in the six-inch diameter pipeline while water was flowing through it but died when the water became anoxic." "The key to minimizing problems caused by aquatic invasive species is to keep them out of the state to begin with," says de Kozlowski. 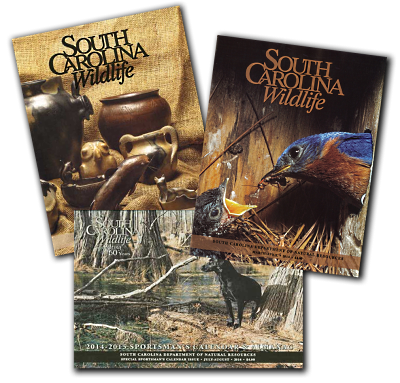 Historically, non-native species have been introduced to South Carolina through direct stocking, aquascaping, shipping, aquarium releases and bait releases. Some species also "hitchhike" on boats, motors and trailers. One invader that likely hitched a ride into our waters on a passing boat is the giant barnacle (Megabalanus coccopoma) discovered in Charleston Harbor in 2006. This barnacle likely rode in on the hull of a visiting vessel, possibly even a brand new one. In fact, this discriminating crustacean has great potential for economic damage because of its preference for attaching to recently submerged surfaces, like new boats and buoys. With increases in global commerce and interstate travel, pinning down a definitive entryway is often an elusive task. To further complicate the situation, many exotic species were intentionally introduced to the ecosystem to solve a specific problem without fully exploring all the ramifications. For instance, nutria were originally imported from South America to help control aquatic weeds, but they have become a major pest throughout the Southeast. Meanwhile, carp is such a common South Carolina catch that many fishermen don't realize it was first ferried in as a food source from Eastern Europe. "We've gotten used to the carp since they've been here so long," says Chris Thomason, a DNR freshwater fisheries biologist. "But they do compete and add a significant amount of biomass to the system that could have been filled by native fish." People are the principal movers of aquatic invasive species, but fighting new AIS introductions is often an uphill battle. "We're not dealing with ecoterrorists," says de Kozlowski. "People think a new species might improve fishing or hunting, or they just don't have the heart to kill a particular plant or animal." Unfortunately, good intentions and minor carelessness can lead to significant ecological and economic ramifications for South Carolina as a whole. "For freshwater and marine animals, there is legislation that prohibits the import of certain non-native species without a permit," says David Knott, a DNR marine biologist. "Unfortunately, it's frequently unenforceable and needs to be revised and consolidated with several other parts of the South Carolina Code." Fortunately, the DNR is not alone in this fight. A number of state and federal agencies and private organizations are working together through the S.C. Aquatic Invasive Species Task Force to prevent, manage, monitor and study invasive species. State agencies such as the S.C. Department of Agriculture, Clemson University's Department of Plant Industry, Clemson Extension Service, S.C. Sea Grant Consortium and federal agencies like the U.S. Fish and Wildlife Service, U.S. Coast Guard, U.S. Geological Survey, U.S. Park Service, U.S. Department of Agriculture and the U.S. Army Corps of Engineers are directed to address invasive species through legislation. Even power companies, including South Carolina Electric and Gas, Duke Energy and Santee Cooper have aquatic invasive species management responsibilities on their hydroelectric power reservoirs. Looking forward, DNR experts expect that a small floating plant called salvinia will replace hydrilla as South Carolina's most problematic invasive plant. Animal concerns include the Asian green mussel, Northern snakehead fish and channeled apple snails. The department also expects an overall acceleration in AIS infestations because of global trade, faster ships and more ballast discharge. Rising temperatures are also likely to extend the range of non-native species from tropical and subtropical environments to South Carolina. Combined with a growing population, the opportunities for unwelcome Palmetto State invaders are on the rise. To minimize the threat of invasive species, the DNR emphasizes that fishermen should never throw excess bait back in waterways and always wash their catch at home. Boaters who are moving from one lake to another should also carefully inspect their hulls and propellers for hitchhiking plants and animals. Finally, water-garden and aquarium enthusiasts should return unwanted specimens, like the red-bellied pacu swimming solo in the Sampit River, to pet stores instead of turning them loose. Text for this supplement by Marc Rapport, free-lance writer and senior writer for the S.C. Department of Parks, Recreation & Tourism.